Winners of the Four-ball Better-ball were Wilson Greenlee & Paul Bates with an excellent 46pts, edging our Brendan Clarke & Canice Hogan by a single point. The Draw for the Preliminary and Round 1 of The Paddy Gormley Cup is as follows. Congratulations to Arthur Tormay and Team 3 winners of The Chestnut Tree Spring League 2019. 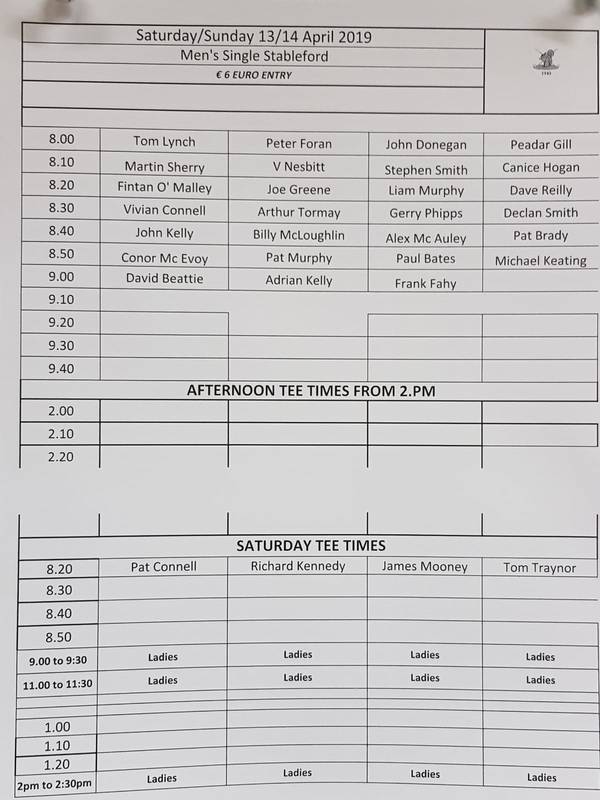 The draw has been made for the Mixed Foursomes 2019. This has always been a very popular competition and this year promises to be a very exciting contest. Four ties will be played in the Preliminary Round with the winners progressing to Round 1. In a small change to previous years, there will be a draw for Round 2 opponents after Round 1 results are complete. The addition of a little suspense will bring an extra element to the competition this year. It will be essential, therefore, to ensure all matches are completed on time. All players’ cooperation on this is greatly appreciated. The final results of The Chestnut Tree Spring League will be announced on Friday night, in the Chestnut Tree, at 8:30pm. Paul Glackin, in the Chestnut Tree, has been a loyal sponsor of the League and we are delighted to be able to give something back. The League has been an outstanding success with 64 entrants and large turnouts every week. The format of the League meant its outcome was far from certain up to the last ball being struck. Next weekend will see a Singles Stableford with the following weekend (Easter) hosting a four-ball better ball. We , then , to move to full qualifying as the course should have fully recovered from the recent maintenance works. All to play for as we head for the final round of The Chestnut Tree Spring League 2019. Arthur Tormay’s Team 3 hold a slender lead over Vivian Connell’s Team 5 and, with the 2 lowest scores in the 7 weeks to be discarded by each team, the possibility of change at the top of the table still holds. Adrian Kelly’s Team 7 are also still in with a shout, only a small bit further back. Brendan Clarke, with an excellent, 45pts, took the individual prize for Round 6 while Arthur Tormay, Martin Sherry and Peadar Gill shared the €2 2s on 18th kitty. Unfortunately the weather put paid to The Chestnut Tree Spring League over the St Patrick’s weekend. Wintry weather and sanded greens tested the golfers of Virginia this week as Round 5 of The Chestnut Tree Spring League took place. With each team’s 2 worst scores to be dropped it’s still very close with all to play for. Pat Connell, with an excellent 41pts secured the individual prize this week with Vivian Connell’s Team 5 edging out the League front-runners, Arthur Tormay’s Team 3, by 3 points. In the overall standing Arthur’s boys still lead the way but only by 3 points from Vivian’s charges.